I have mentioned before that my husband and I play Minecraft together. So when his birthday came up, I couldn’t pass up the opportunity to build him a Minecraft cake. He had no idea what he was getting for cake. Since I didn’t want him to help out too much, I had my sister come down and help with baking and watching the kiddos. We sent my hubby out to go mow the lawn and we got to baking. This cake was a lot of fun to make and was easy to build. The key is having a cake that isn’t going to crumble on you when you cut it. So I found a recipe for the “dirt” part of this cake and adapted it for the “sand” and “water”. Want to know what the best part of this cake is? You can build any “world” you want. You just have to play around with your squares. More on this later. Now to give you the recipe for the cakes. 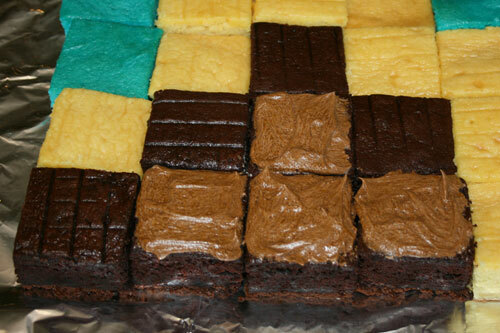 This is the recipe for all three cakes to make the dirt, sand, and water in the Minecraft Cake. Combine the cake mix, egg whites, water, vegetable oil, pudding mix, and sour cream on low speed. Once combined, mix on medium speed for about 2 minutes. Batter will be very thick. Spoon your batter into your pan. Do not pour. Batter is too thick. Smooth out the batter in the pan with a spatula. Bake 25-30 minutes at 350 degrees. Insert a toothpick into the center to see if it comes out clean. If it doesn’t, cook a little longer. Cool in the pan for about 10 minutes before flipping it out onto a cooling rack. 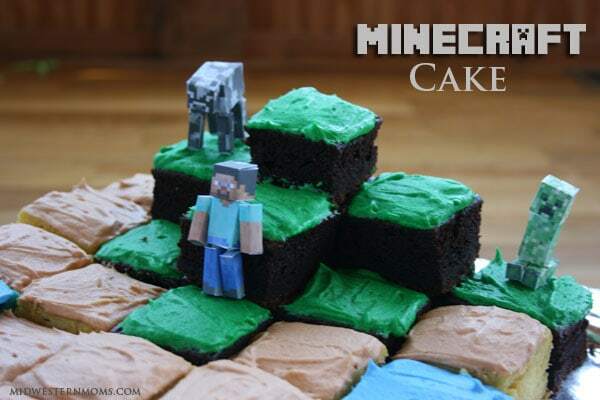 Continue reading the post for building your Minecraft Cake. Now for the fun part, building your cake. Like I said before, you don’t have to follow the design that I made. 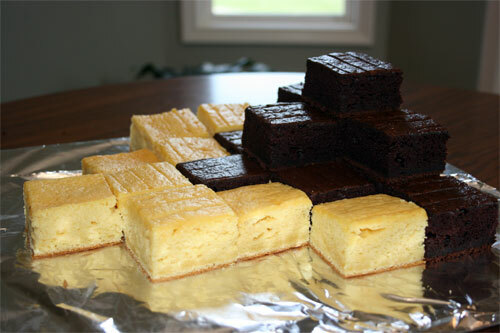 Think of your cake squares as building blocks and see where your imagination takes you. 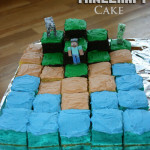 That is the fun part of Minecraft and therefore, a fun part of this cake. 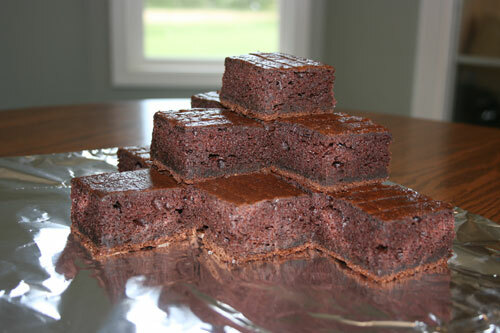 Step 1: Cut all the rounded edges of your cakes off. You need nice clean edges to work with. 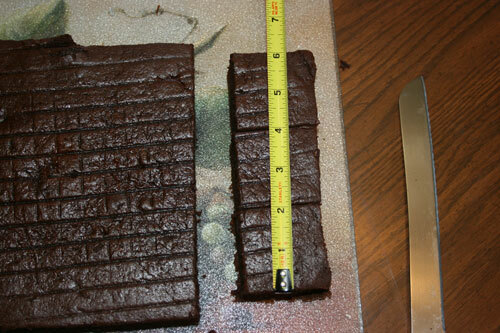 Step 2: You want to cut your cakes into 2 inch by 2 inch squares. I used our measuring tape to make sure I got them the right size. Step 3: Start Building. This is where you can get creative. Just imagine the cake pieces as blocks. Nothing is set in stone yet, so have fun playing. Step 4: Once you have everything the way you like it, it’s time to add frosting. I used a buttercream frosting (find the recipe here). I only needed one batch of frosting and I just divided it into smaller portions for the colors. I made a brown frosting for the squares that have another square on top of it. This helps to keep the cake squares together and who would want to piece without frosting. Once that is done, frost the grass onto the dirt, sand onto the sand, and water onto the water. You want to know what the best part of this cake is? You don’t have to cut it up to serve. It’s already done! Makes things go quicker during the party. The three cakes made a total of 45 squares. I didn’t use them all in the cake but they would work as cupcakes should you need them. 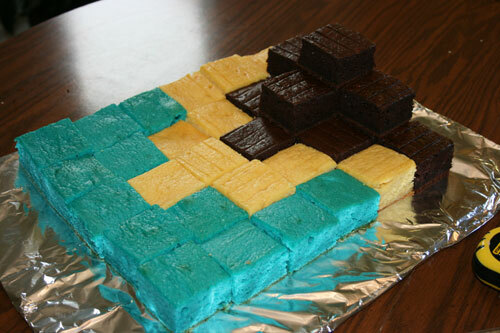 I added a few 3-d cutouts from Minecraft to decorate the cake. You can find them here. They did take some work to get them done. Don’t expect to make them in 5 minutes. 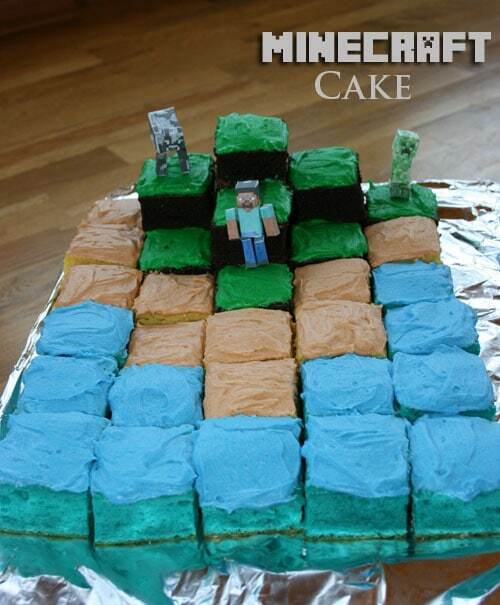 Have you held a Minecraft or themed party? Were you brave to make your own cake? I know a few little boys who would love this. Thanks! 🙂 Pinning for later! My 2 year old loves to watch Daddy Mine. So he loved the cake and he got to play with the little people afterwards. My nephew would go crazy for this cake. Very cool! It was a lot of fun to make and my Hubby Loved it! He had a huge grin on his face when he seen what I made. How fun that you were able to personalize it! 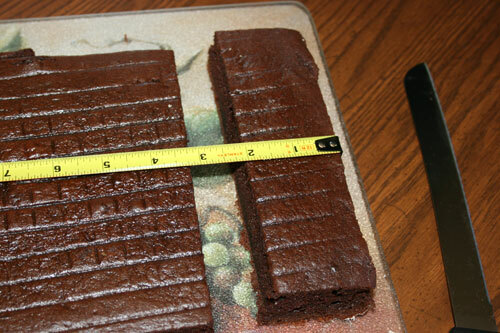 And extra kudos to you for measuring out your squares! Math and I are moral enemies. Great job on the cake! This is a neat idea. I don’t play but I live with many who do play everyday. This is so cute!!!!! I love it! You did a fantastic job.